Look at any events that might effect meal times and make a note of it for that day. Such as “Friday am dentist, 3pm playdate.” On days where you will be out all day or just before dinner time, you can plan a crock-pot dinner or a leftover night. You can also choose your easiest breakfast and lunch options for those busy days. Browse through your fridge, freezer, cupboards, pantry, etc. and jot down meals or snacks you can make using entirely or mostly what you already have. Also jot down ingredients or freezer meals that need to be used up soon. As you start writing down meal ideas and browsing your cupboards, also note any ingredients you are running low on or know you’ll need to complete a meal. Now sit down and start filling out the meal sections, taking into account the information you’ve collected so far about schedule and what you have on hand. Plan the dinners first, then lunch, then breakfast. Often you can have dinner leftovers for lunch or for dinner another week. During the course of the week, I stick to my meal plan about 50-75% of the time. On a good week. That’s ok! I often switch meals around based on need or desire. I don’t even bother updating my meal plan. Sometimes I completely space things for the day (or week!) and am tempted to suggest ordering out… However, I’ve found a good solution for that! To create your backup plan, take 5 minutes to make some lists. Write a list of meal ideas that you know you can usually pull together very quickly with what you normally have on hand. Then tape these lists to the inside of your cupboards! Not only will they save your bacon when it’s 5:00 and you realize you forgot to thaw that chicken, but they come in handy for planning purposes. That’s it! How do you plan for meals in your home. If you don’t plan meals, what keeps you from making a plan? Great ideas. I also try to plan out my meals, but there were good tips in here. Could you post your back up dinner list picture? I’m always looking for ideas. Hi Jessie – I updated the post with that picture for you. It’s not a very long list right now, but I’m working on it! 🙂 LOVE my backup meals. Because I often forget to set things up the day or two before when needed. I’m getting some great ideas from your blog! 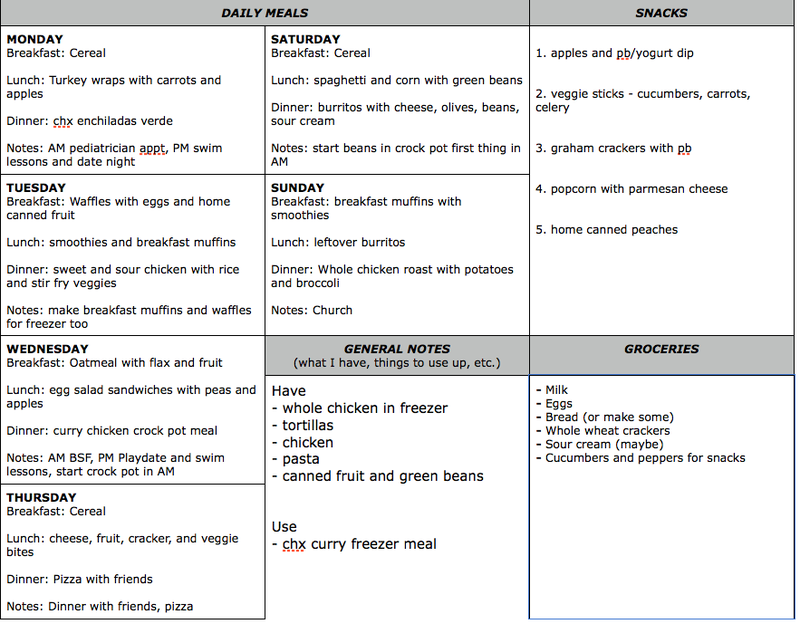 I already meal plan, but I don’t do the part where I write down what I have already, or could use. I think I’ll start doing that. So glad you found it helpful, Desiree! This is pretty much what I do too…great system! Thanks for the meal ideas!